Music has the power to bring people together, express deep emotions, and serve as a therapeutic release. 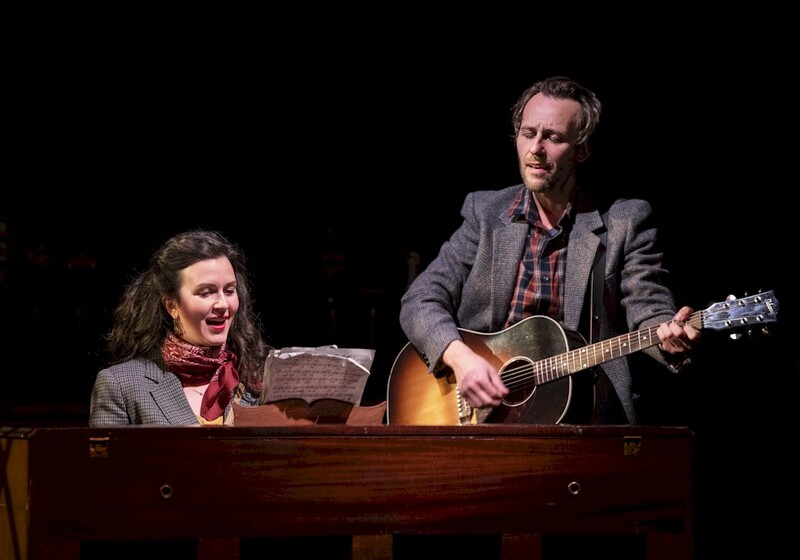 In Once, it’s all those things and more as an Irish boy meets a Czech girl who reminds him why he loves making music. The only problem is, this production didn’t do the music justice. Glen Hansard and Marketa Irglova’s music, that first appeared in the film Once before becoming part of a Broadway hit, is beautiful and unforgettable. As was the production of Once that I saw in London’s West End. It was one of those life-changing, heart-tugging, perfect moments that remind you why musicals are so powerful. Since then, I’ve seen the Broadway Across Canada production and was also impressed, but it didn’t quite live up to the London performance. So I think that’s the problem. It’s hard for me not to compare this Arts Club production against that life-changing moment, and this one just didn’t do it for me. I love the music in this show, and Adrian Glynn McMorran (the “Guy”) is clearly a talented musician. His solo work is full of melancholy folk music passion, but I didn’t see that come through in this performance. Gili Roskies as the “Girl” also gives a decent performance, but they both seem to lack the deep melancholy that is so entrenched in this story. Along with the lack of melancholy, there were many moments that were played for cheap laughs or made to be a bit cheesy, and that kept us on the surface of the story instead of allowing us to delve deeply into it. A bit more urgency, a bit more passion, a guitar played so forcibly it almost has a hole in it — that’s what I was hoping to see. While there were some disappointments, the show is a lot of fun and the whole cast are talented musicians, some taking up multiple instruments during the show. It was wonderful to have the stage full of the lively Irish and Czech folk music that infuses the score, and when the whole ensemble got dancing, things really came together. Another fun element is being able to buy a drink at the on-stage bar pre-show and hang out as if at a real Irish pub. If you aren’t able to make it to see this production, I urge you to seek out the music of Once. It’s so full of emotion it’s almost impossible not to be moved.